The Perth Mint has released the second coin in the Australian Bush Babies II series. 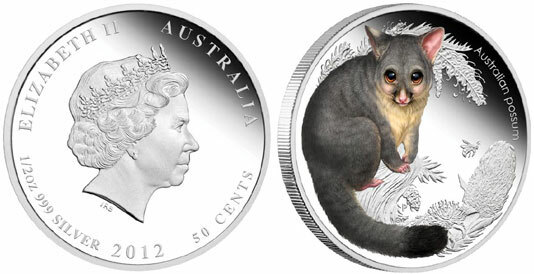 The one half ounce 99.9% pure silver coin features a baby possum. The possum is a small to medium-sized marsupial native to Australia. It is usually active at night and sleeps during the day. The female possum carries its young in a pouch. The possum is protected by Australian law and is an important animal in both culture and folklore. Depicted on the reverse of the coin is a colored image of a baby possum intended to capture its innocence and gentle playfulness. The background contains frosted representations of Australian bush flowers and an insect. An inscription reads “Australian possum” with the Perth Mint’s “P” mint mark. The obverse of the coin includes the Ian Rank-Broadley effigy of Queen Elizabeth II with inscriptions indicating the date, precious metal content and purity, and legal tender face value. The coins have a limited mintage of 10,000 pieces and come in presentation packaging with a numbered certificate of authenticity. Each coin has a diameter of 36.60 mm and thickness of 2.30 mm. In July the Perth Mint released the first issue of this new series featuring a baby kookaburra. The final three coins of the series will feature a baby platypus, echidna, and wombat. For additional information and orders, please visit the Perth Mint’s website page dedicated to the series.